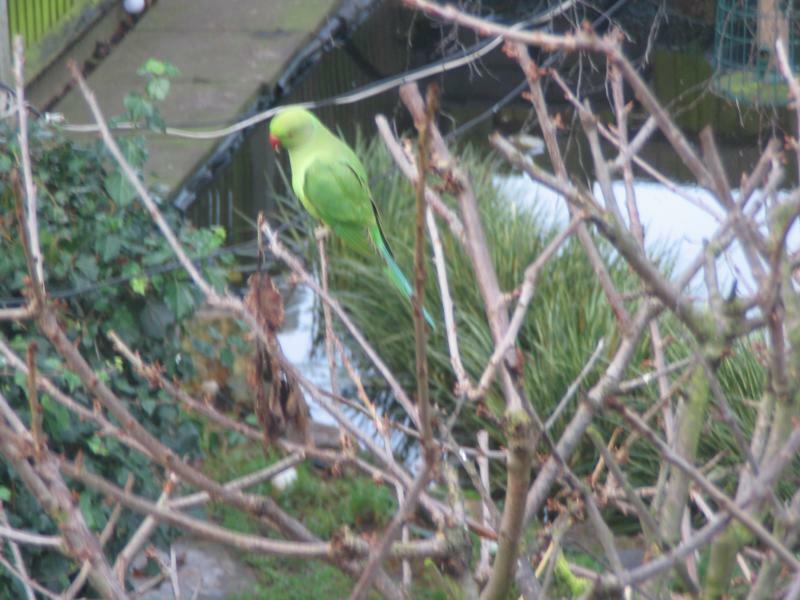 but apparently there is a large and noisy population in London. 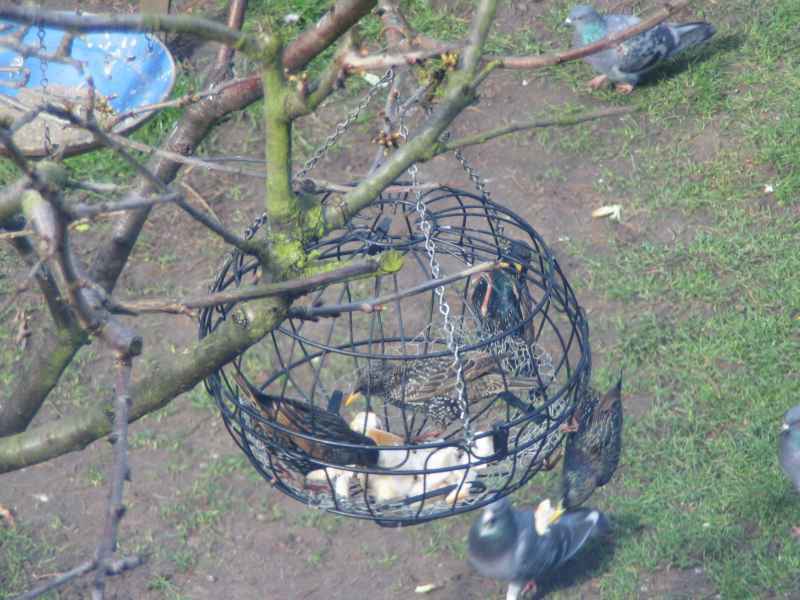 access the feeder for food. 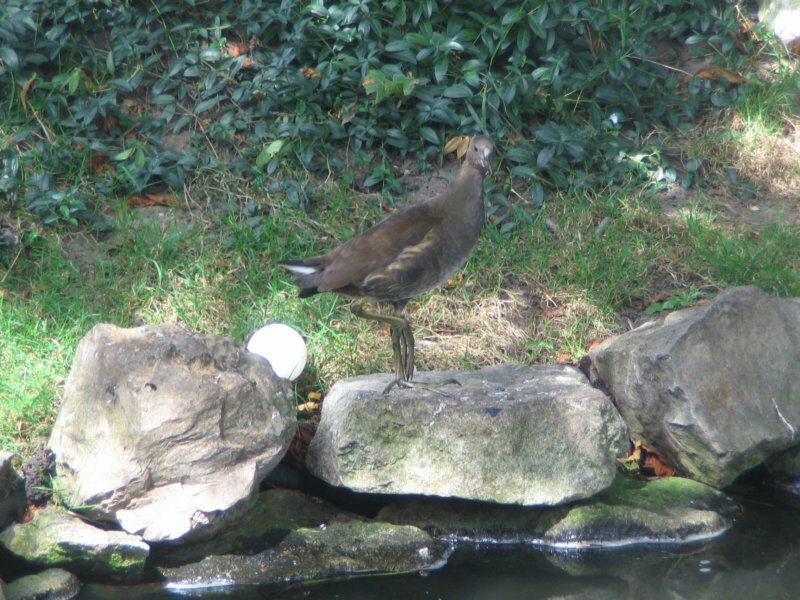 toes, white and blue rump plumage. 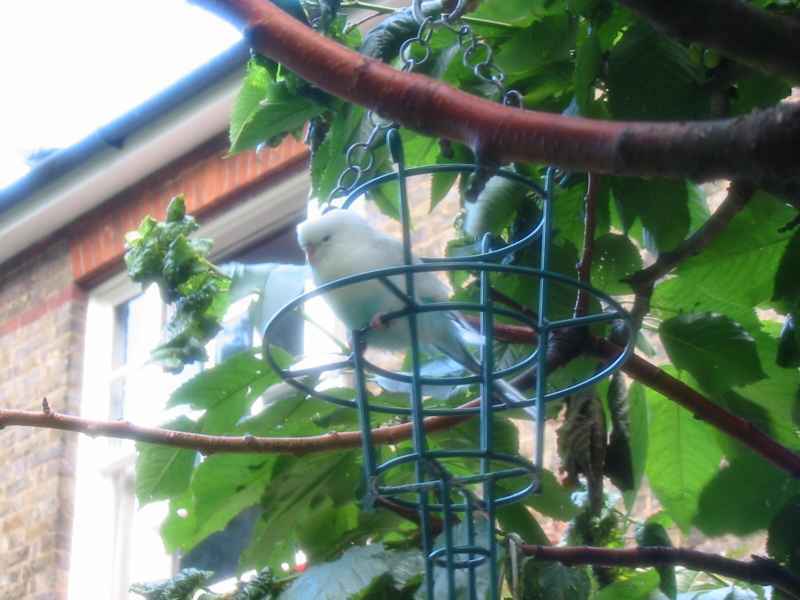 A budgie or Parakeet that arrived for a few days one summer, very tame, and hungry. 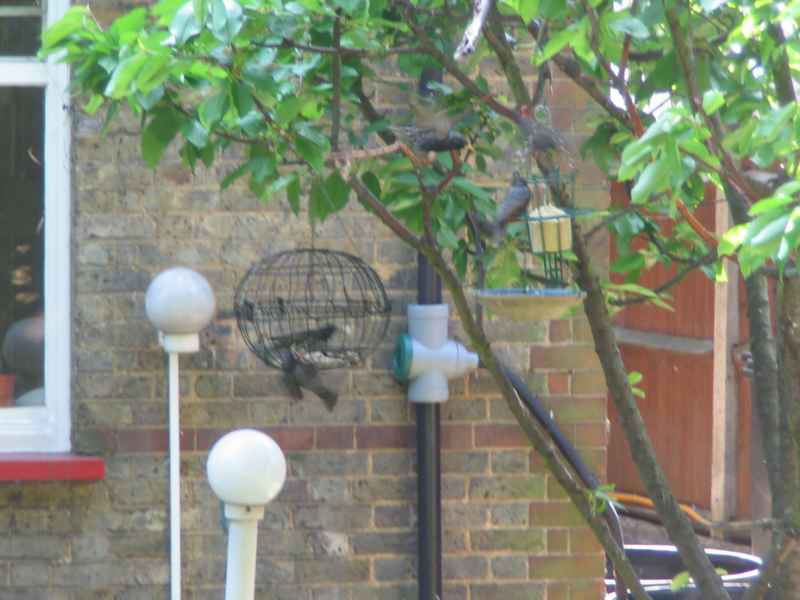 One of the crow parents feeding the three fledglings, taking food from the cat bowl. 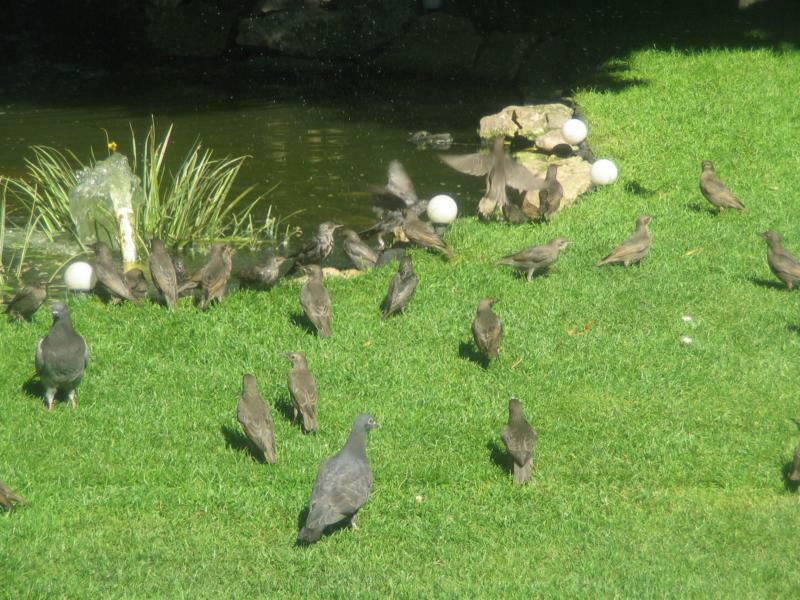 Their nest has been in the next garden for several years. 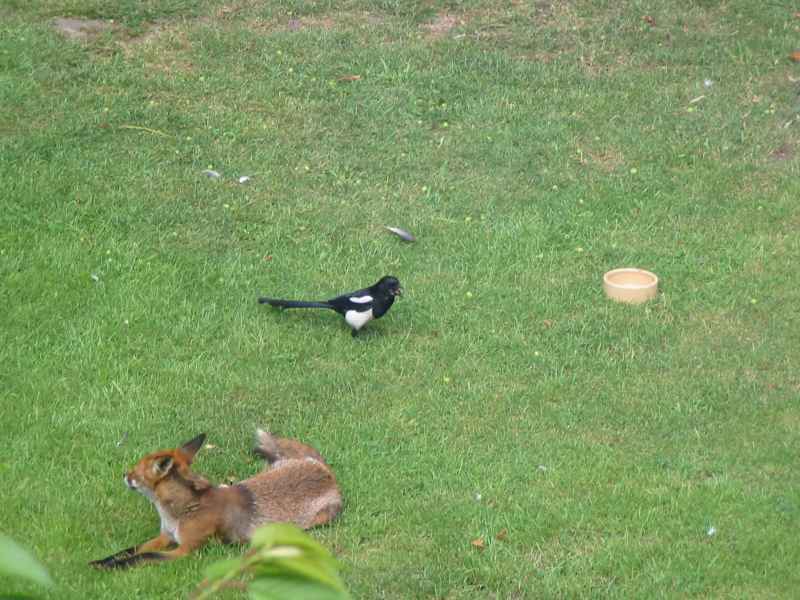 One of the magpies ignoring the fox. 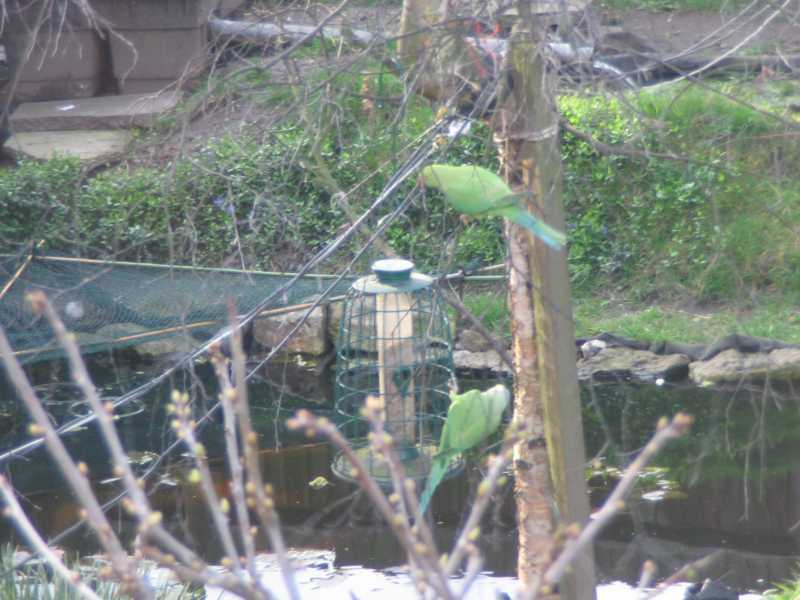 or noticed any fish missing. 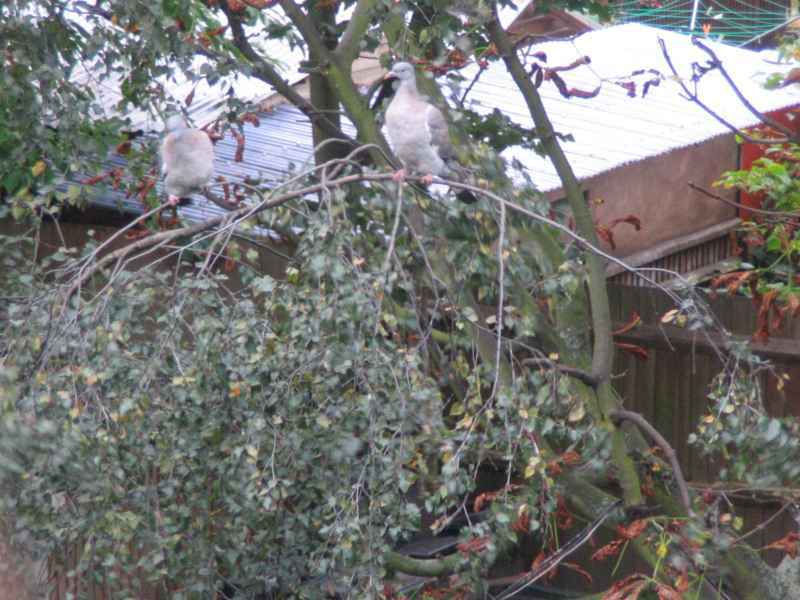 But I do try and frighten them off when I'm able, usually instead of taking photos of them. 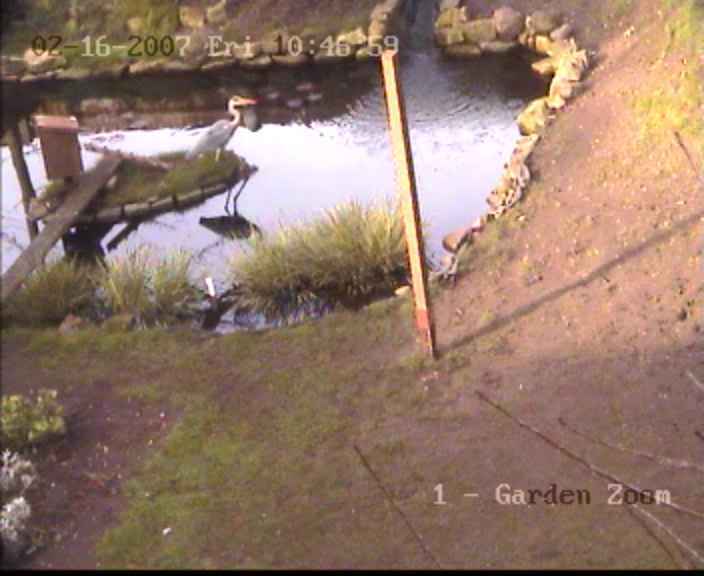 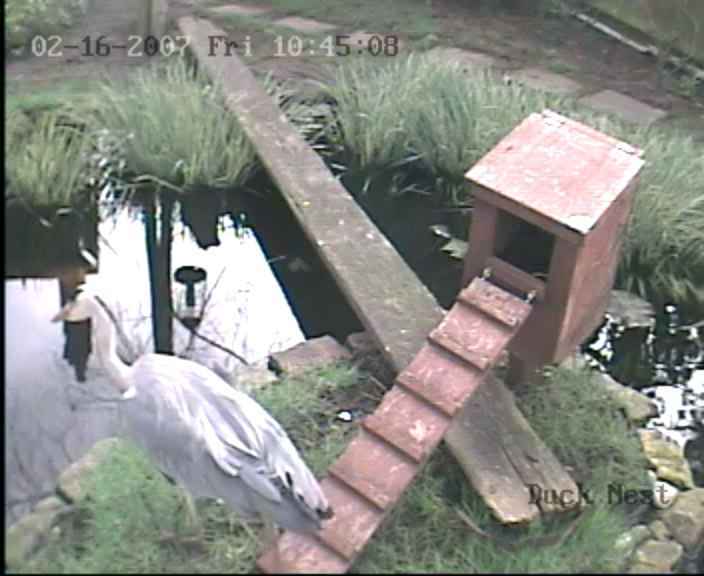 Same heron from the CCTV camera over the island. 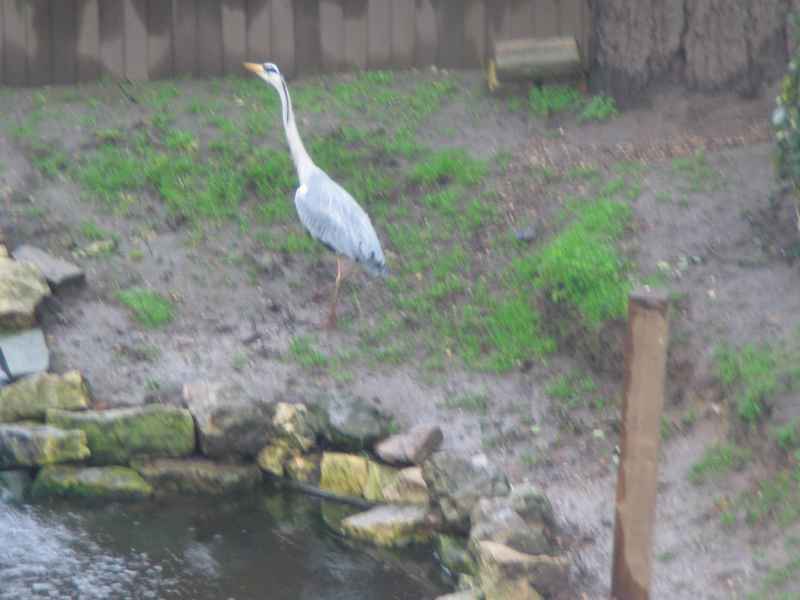 This heron walked all the way around the pond. 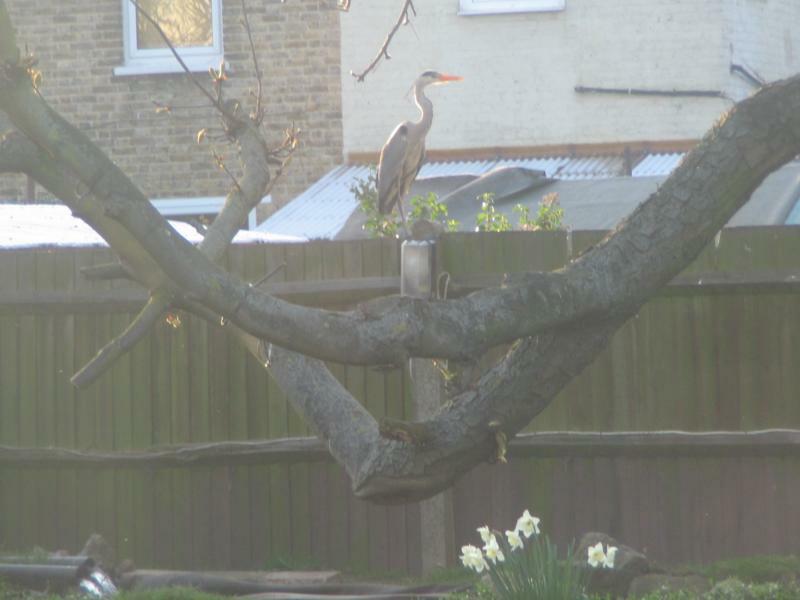 The heron thinking about the fish. 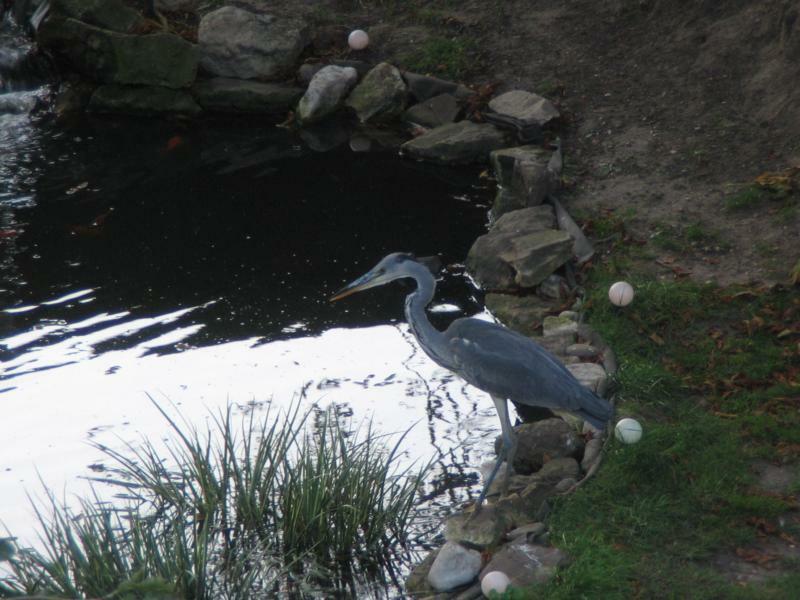 The heron looking into the pond. 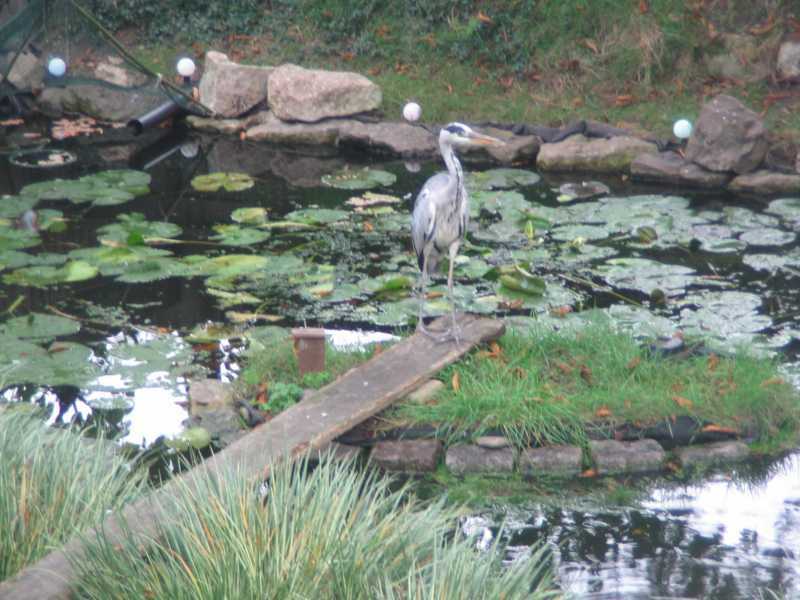 The heron visiting in Autumn 2008, mostly herons get mobbed by the local crows and don't manage to land near the pond. 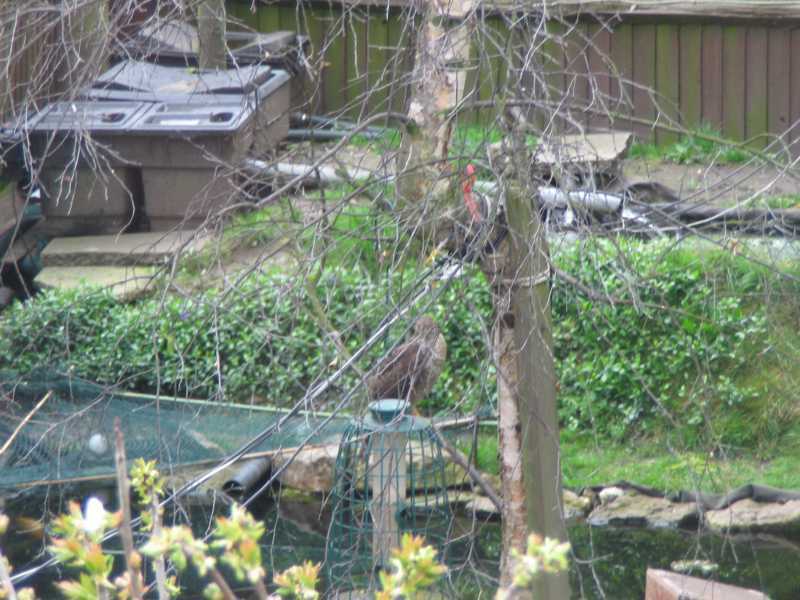 I think this is the sparrow hawk waiting to swoop down into my garden. 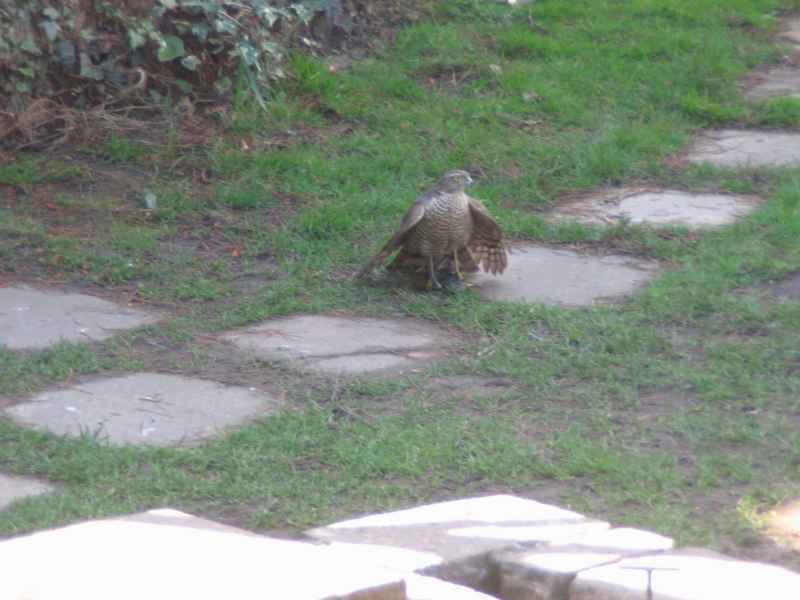 The sparrow hawk standing on a starling that it caught, I frightened it away and the starling flew off. 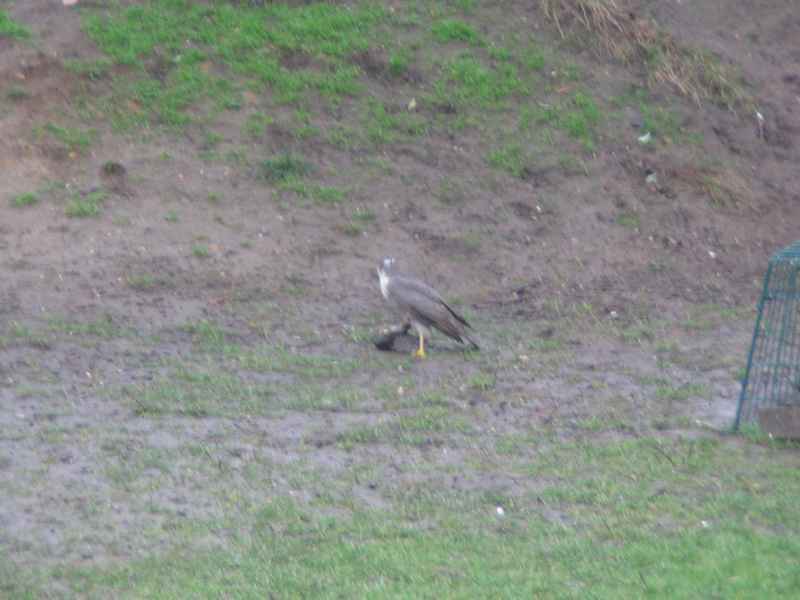 The sparrow hawk with another starling, the sparrow hawk flew off with this one. 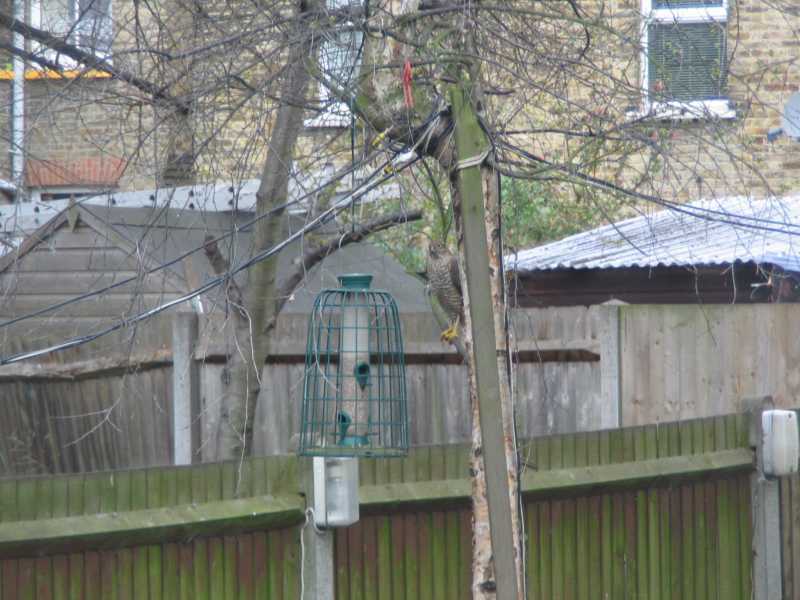 The sparrow hawk looking at the bird feeder. 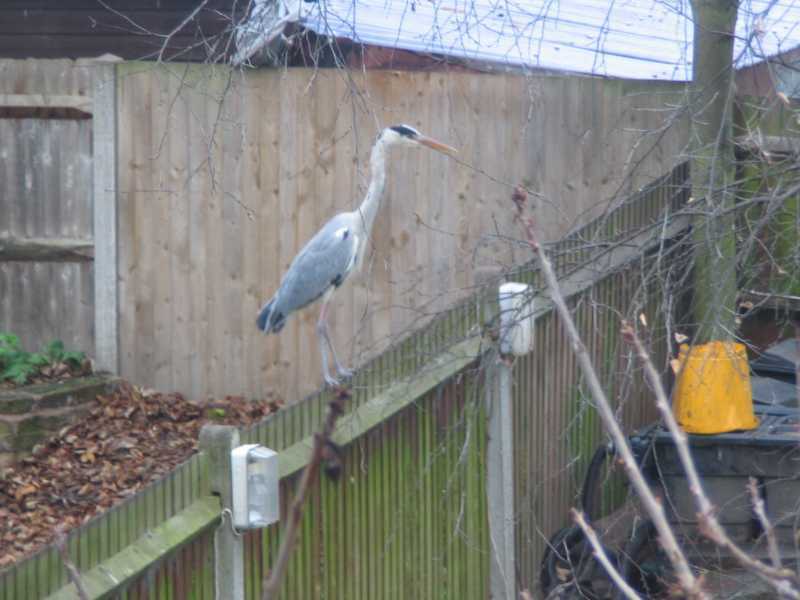 And trying to get at the bird feeder. 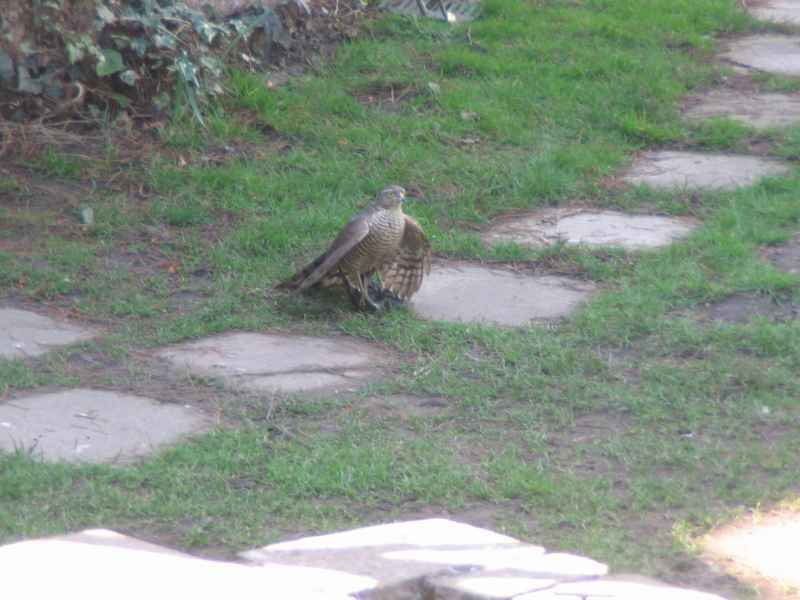 The sparrow hawk catching another starling. 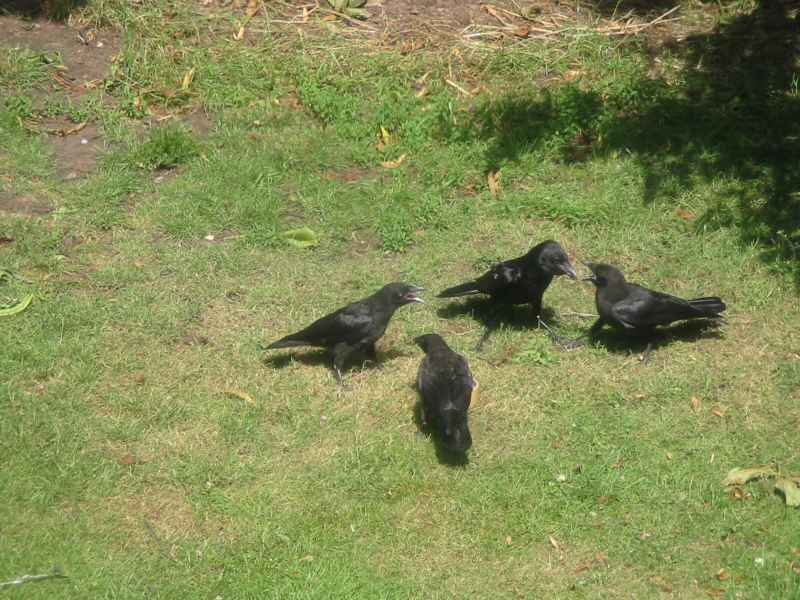 lawn so they get some anyway. 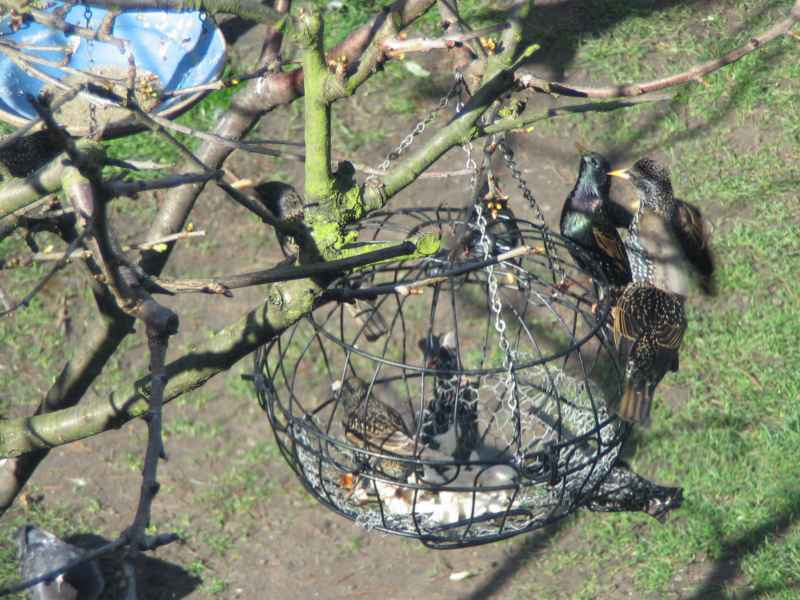 There can be up to 50 starlings here, and they eat about one loaf a day, two or three loaves in the breeding season. 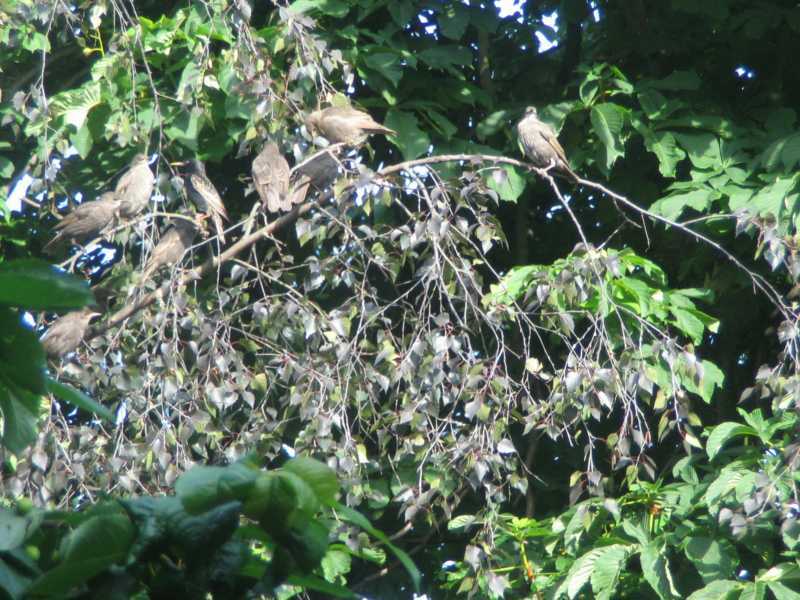 Fledgling starlings still fluffy brown waiting to be fed by adults. 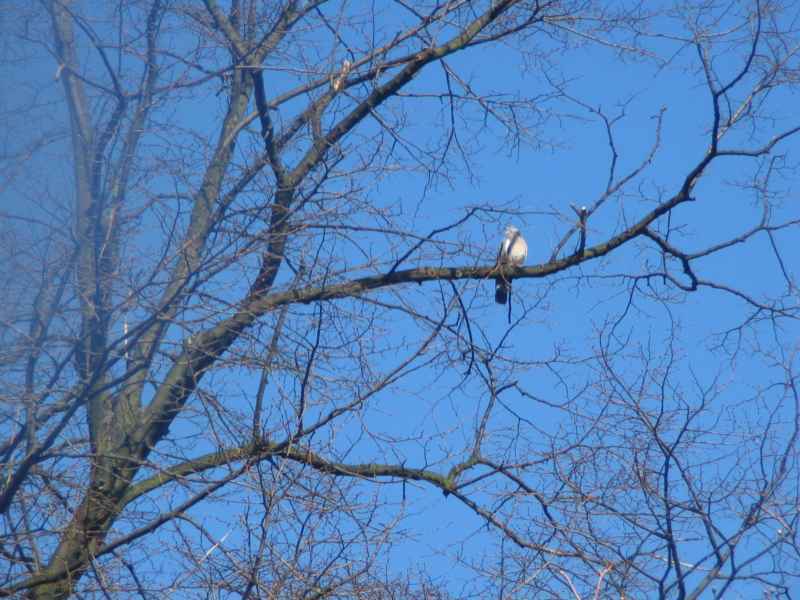 They take a few months to turn spotted black. 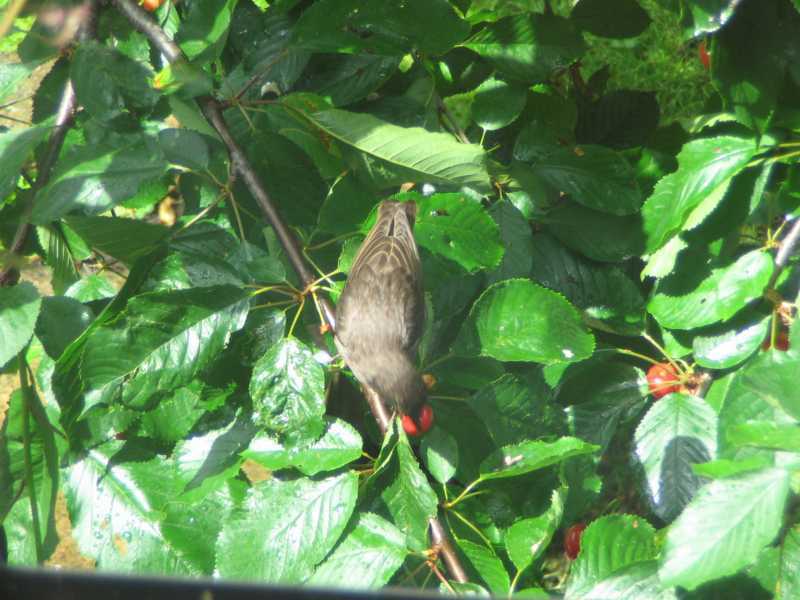 Another fledgling starling on eating a cherry. 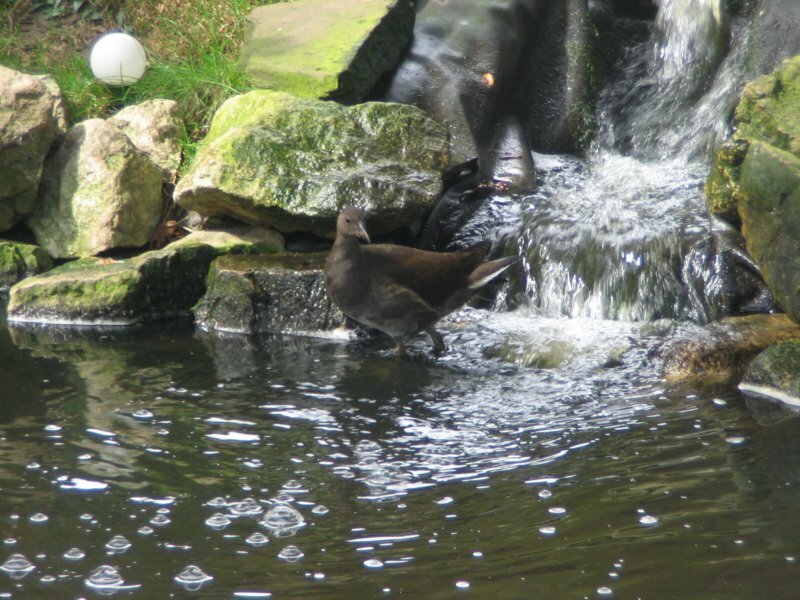 More fledgling starlings bathing in the pond. 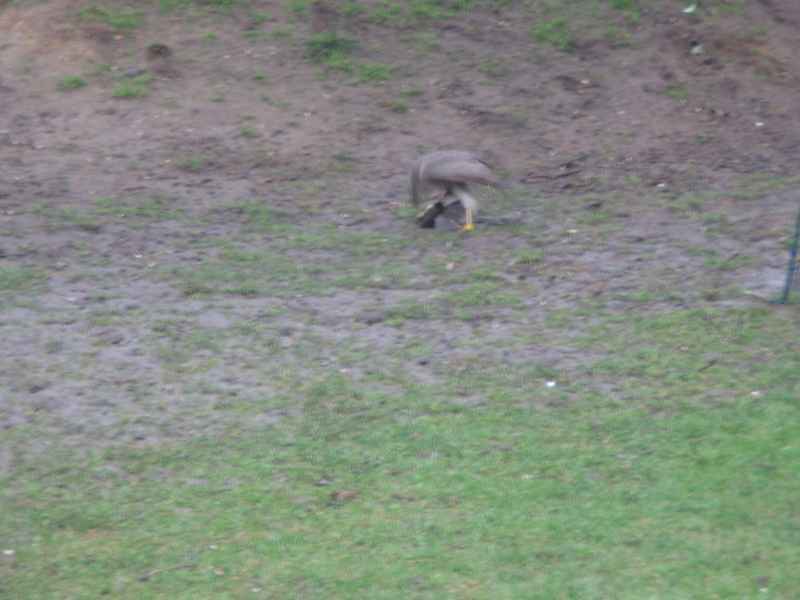 A crow caught one shortly afterwards when it too wet to fly away to safety. 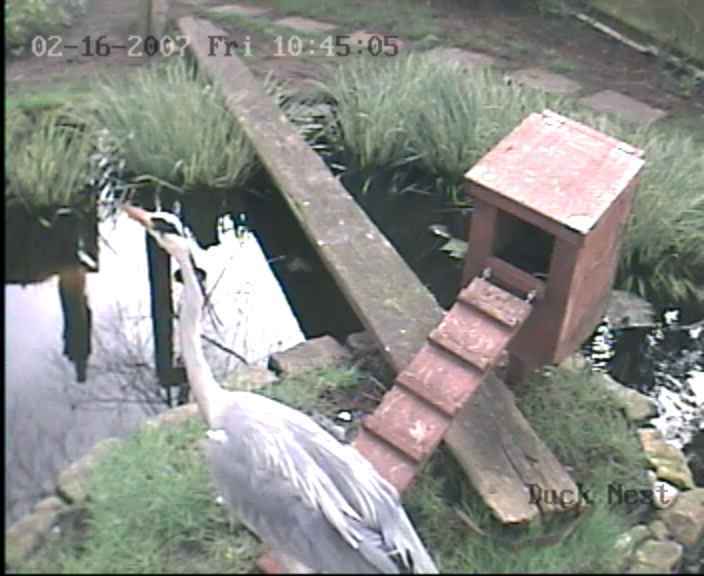 three days, but in the breeding season can finish a kilo in a single day if I forget to bring it inside, but at £5 each I try not to forget. 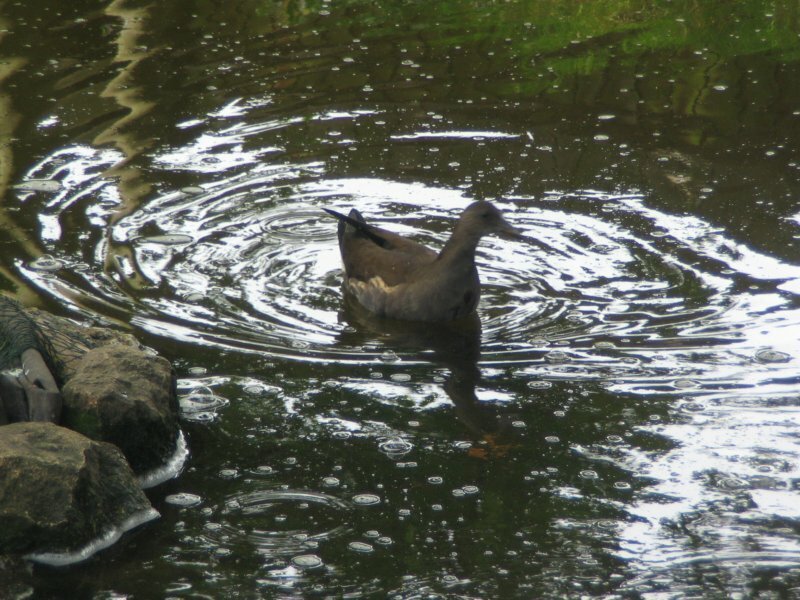 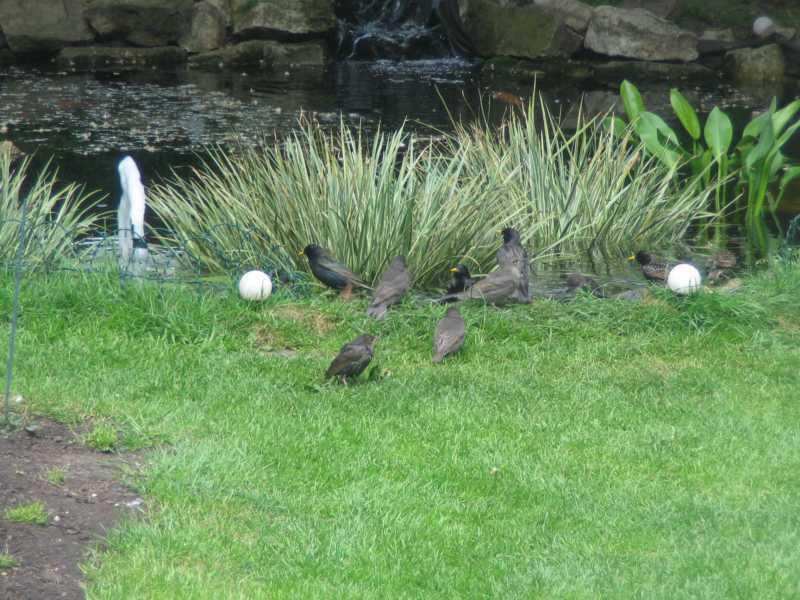 June 2009, lots of starling fledglings bathing in the pond, waiting for their mothers to feed them.